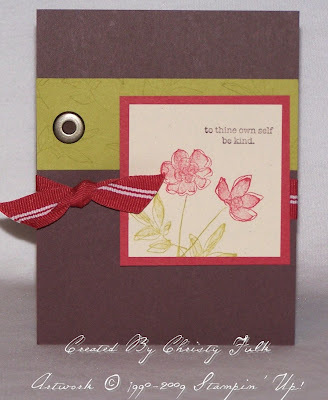 This is the first card I've made with this upcoming Sale-A-Bration set, Botanical Blooms. This year, Sale-A-Bration has 4 stamps sets, a pack of designer paper, and a ribbon bundle to choose as a free item for every $50 order you place from February 1st to March 31st. So, if you like this set, you'll need to place a $50 order in February or March to get it free! If you place your order online, it will be shipped directly to you. You don't have to worry about having to pick it up from me if you don't live close. Just go to my SU! website, and click "Shop Now." After Sale-A-Bration, this set will be gone forever! You can also earn this stamp set if you host a qualifying workshop during February or March. Supplies: Botanical Blooms Set (SAB); Chocolate Chip, Riding Hood Red, Kiwi Kiss, & Naturals Ivory cardstock; Riding Hood Red, Kiwi Kiss, & Chocolate Chip Classis Ink Pads; Riding Hood Red Striped Grosgrain Ribbon, Crop-A-Dile, & Antique Brass Jumbo Eyelets.